gnarl's journal, for the month of August, 2002, in which we discover this is an early birthday present, cats hunt and pester, and a battle commences a few miles from home. The past couple of weeks when I've been out and about in the afternoon, the patient has been sequestered in the dining room, tapping and grouching away. 'Don't peek! Don't come in!' she'd cry out whenever I'd come back, approaching the room bearing cigarettes or the umpteen pills she's supposed to be taking. Fine by me, keep her active, I'd think, and sit out on the back porch with the laptop and play games for hours as the sun set and shadows lengthened. zot would be perched on an arm of the bench, zenning out. Unless a moth would stumble by, then she would be all 'ee! ee!' and leaping after it until she caught and crunched it. A couple of months ago I heard a frantic keening, an excited zot. So I shrugged my shoulders and followed the sound, hoping it wasn't another bird, or mouse, or --worse-- a toad. On the back porch, there zot was, tail a frantic quiver, paws pinning down a moth the size of my hand. It wasn't a Luna moth, some sort of Junebug moth. Sigh. Picking it up, documenting it with the camera, then, oh well, letting zot have it. Hours of cat entertainment. I'd figured the invalid was working on some sort of webbish project, why else would she be on the computer? She wasn't writing, that was for sure. Perhaps she was creating a photo album? or tweaking all my pictures with little easter eggs and fey fairies in shadows to mess with my head? or maybe she was just playing computer solitaire, for hours on end, and the surprise for me was that after winning a hundred games Bill Gates personally delivers a congratulatory real deck of cards. But no, it was a web project. A website all for me, with a very nifty domain name. 'Neural net?! Cool!'. Something for me to play with, to use as a tool for getting more writing done, for showing off the things I've seen, something very fine indeed. Every year on our birthdays we make things for each other. I usually go for some sort of story. heyoka goes for something different each year, either a bound book of my favourite tales, or a collection of pictures. This time, my birthday came early. Ah, the trill of birdsong. A symphony of warbles, squawks, and coos, with the occasional purr of a stalking cat. We've had a few close ones. A screeching baby bluetit was rescued a couple of months ago. A thrush torso was discovered around then too, but we think it just flew into the wrong window and couldn't find the way out, as nothing seemed chewed up: death by heart attack was the prognosis, and it was duly buried under an euphorbia. Mainly, the cats sit around and drool. The blackbirds tease from rooftops, or across a lawn to flutter away was a cat encroaches. Two doves regularly shag in the chinese poplar, enticing kitsune up the trunk and along the branches until they flutter chuckling off and leave him stranded. Don't think them too bright: they forgot to build a nest so all their eggs roll from the tree to shatter on paving stones. Last week, a toad hopped in, to be chased by the gleeful cats. We kindly returned it to the pond. Normally, zot waits by the pond for hours for either a toad or the fish to hop into her paws. Yesterday, kitsune attempted to crunch up a dragonfly, but our houseguest saved it. And again, our houseguest, on her way to the shower, noticed kitsune with a lump in his mouth. I extricated a heart thumping wee baby wren. The cutest damn thing, looking like it had just been pushed out of its nest. This one was examined for broken bits and deposited in the ivy, where it fluttered a bit. We still await the first kill. That's what that infernal cat is going to be. I've been thinking this for ages. She's a marvelous creature, zot. Just about my best friend. Follows me around the home, almost always sproings home when i call, and often just has to be on my leg, lap, or shoulder, perched and purring. And that's part of the problem. It's not that she wants to be there, she has to be there. Whether I'm sitting around reading, or at the computer or in bed, there she is, clambering, leaping, slinking, worming her way up. A curled up or perched purring cat is a Good Thing, and one can have too much of a good thing. Like those moments when you just don't want people to touch you, or come over to your table because you're busy being alone. Shoving her off doesn't work. She just comes right back. Picking her up and dropping her doesn't work. She just comes right back. Throwing her across the room doesn't work. She just comes right back, a masochistic drooling and rumbling beast. Putting her in a closed door room doesn't work, as she'll scratch scratch scratch scratch scratch away until the door magically opens and... She just comes right back. All this is just annoyance, a game, a little to and fro... up comes zot, down goes zot. up come zot, down goes zot, ad naseum. Eventually I give in and she compromises by wiping her drool off on my chin and settling down on my knee, zen-contemplating the denim threads. And eventually, well, within a few minutes, I forget how pissed off I am with her and scritch her chin. What will be the death of me is when she gets frantic in the night. A meeping leap and oomph and stoMP STOMP STomp. A breathing: she doesn't really purr, it's more like Darth Vader with a black lung. A half-purr panting. In the middle of the night, in the midst of dreams, this is not what one needs. It's more insistent than the normal leap up, because it's not to settle in, it's to just stomp around. I have no idea why she does it, perhaps it's from the dark dark day whe was found in a rubbish bag by a bicycle courier and delivered to Battersea Dog's Home. She can't be hungry, as she's always done this, even when there was a kitchen with a plate of cat food a few feet away. She just...pesters, frantically. and pesters and pesters and pesters. I keep doing that shoving her off thing, which I know doesn't work, but being groggily half-asleep isn't good for the thinking process. Or the health. I keep thinking of those sleep REM expirements, where the scientists would rouse people just before they started dreaming, so that over time they grew more and more irritable. This is me, awakened dozens of times in the night, just as I slip into dreams. Perhaps this is what she means to do, keep me from my dreams to steal them for her forever squirrel naps in the day. Or to drive me insane, so that one day I hatchet up the village. I have scars. the latest is from last night, when after hours of pestering, she leapt up on the bed when the morning alarm went off, using my arms and leaving a two-inch bleeding crescent. Sometimes she sits on my chest and pokes a claw on my eyelids. (she never swipes out to scratch, but has the habit of hooking paws out on a shirt or pillow case or eyelids) Or just sits on my bladder, sits with such force i believe it will burst and that will be the end of me. Or on my neck, cutting off my breath. In between flings off of the bed, she'll head to the nearest plastic bag and lick lick lick lick lick lick lick, repetitively and insistently so the only solution is either hunt the bag down and get rid of it, or bunch under pillows, smothered to muffle the sound out. Couple of nights ago, we slogged through watching the entire series of channel 4's production of Dance to the Music of Time. Absulutely wretched. Man talks to naked lover about his childhood friends. They split up. Friends all die or become increasingly insane while he smiles a little. Wives leave husbands. It continues to get even more awful, beyond the 'so bad it's good' factor. The entire seven hours was worth it for the following. Right before world war two, main character is talking to composer friend. Main character: Writing is impossible with Hitler around. Last Monday I headed over to Eye (the place to be on palindrome day), and watched a battle involving cannons, muskets, pikes, and a couple thousand people in costume. 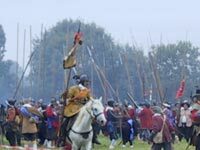 This was the Sealed Knot, an organisation that recreates the battles of the Civil War between the Parliamentarians and the Royalists. I've never seen anything like it. Sure, I've been to Ren Faires and seen the Society for Creative Anachronism whack swords at each other at gaming conventions, then get drunk on a couple of pints and sing filk. That was like watching Hogan's Heroes instead of Saving Private Ryan, or going to Sleeping Beauty's Castle instead of the Tower of London, or eating a McFalafel instead of, well, you get the picture. Parking in a hayfield, I strolled into the fairground, an old airfield near Eye next to the aptly named Dragon Hill. Carriages pulled by ponies and Suffolk Punch horses rattled by, Steam Engines cut planks, and a cowboy had a shootout at a cardboard wall of a saloon. The place couldn't decide what decade OR century it was. Further in, I passed the tents of the 'open to the punters' senction of the Sealed Knot, where wool was spun, pipes were piped, pots boiled, and... actually it was empty... they were all over by the field where the battle was to take place. I'd arrived just in time as horses passed right by me again, this time the calvary of the Parliamentarians. Rows of people were gathering and I headed further down to where I was closer to the rope barriers. Further along a helicopter landed and took off again in a roar. In front of me were people sitting on haybales before two rope barriers (a post bearing the sign basically saying 'this is dangerous and you paid for that, so it's not our fault if you get stabbed, shot, blown up, trampled or embarrassed'), beyond which was a little faux brick building surrounded by a makeshift fence, underneath a telephone pole. How the heck was this going to be pulled off? Buzzing roar of a helicopter to the left, telephone wires overhead, brass band playing in an arena behind, and squeals from a bouncy castle off to the right. Then the troops arrived, a few hundred of them, dragging out cannons, carrying pikes and muskets, drums insistent rhythm, a few standards unfurled, congregating near the brick building, explained to us as an ammunitions base for the Parliamentarians, and a tasty sparsely-defending source of supplies for the Royalists, thus the battle about to commence. In between the roped-off barriers, a few costumed folk wandered by, some to warn parents of small children to cover ears when cannons went off, others to mention that if a pile of pike-scrumaging fighters fell over, we could get stabbed. A rotund man sold off little flags, asking who we were for and p-shawing when people weren't sure, or just didn't know. Everything was getting busier, the crowd shifted in excitement, announcers blared bits of info and warnings, the royalist troops began arriving way on the other side of the field, which sloped shrply down to the faraway Sealed Knot Encampment, warning cannon shots boomed towards them, the cavalry rushed down and clashed a few swords. In front of us, a woman holding a baby and trailed by her mother searched the crowd for her errant husband. Muskets fired, smoke from these and cannons wisping across to us. Pikes slanted out from groups to form a 'hedgehog'. The drums kept up as we were told that these sent messages to the troops, when to retreat, move forward, when supplies were coming, or danger; once the drums stopped, the battle would be over. This battle was just beginning. A girl tried to sell off the bloodied bonnet of a girl and a pair of leather gloves. "There's a war on you know," she confided, and a woman in the crowd gave her a bag of sugar candy. "A king's ransom! Don't pay attention to that man, coming: He's mad!" 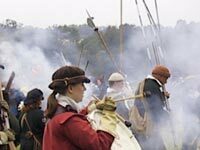 More troops arrived, and eventually about 2000 people were on the field, support troops led by Cromwell to defend the ammunition, and Royalist reserves trudging in with a roar. Cannons fired over and over, one of them exploding from the heat. One side would surge forward, and another would retreat and reform and push it back. Sometimes there would be a mass in front of us, then over to the right were most of the crowd watched. Throughout all this, fights went on way down the field, beyond our vision, and so just a battle for those fighting. A pair interviewed the generals and other fighters from the field, and over the loudspeakers the spatter of shot and cannons and yells of fighters added a strange effect. It all worked for me. I was completely drawn up in it, in spite of the copter, overhead wires, people behind me on mobile phones, and bad jokes from the announcers. The distractions evne added to it, made this recreation an insistent tableau. When a member of the crowdline diverted us with some silly historic anachronism, I was grinning all through it, then pulled straight back to the field, watched the sound and fury. For almost two hours the battle went on. It was hard to focus on one little bit, instead, I found myself following a drummer, then watching a musketman load his weapon, then gasping at horses wheeling around a troop of pike men. Sometimes the pike men would drive into a whirling circle against another troop, pressing around until they collapsed away. The "dead" would be attended by medics, or left to lie; after a few moments they would raise themselves, shake their heads and then get back to it. A misty rain chilled us, but the battlers were almost steaming with activity. Eventually a standoff was had: the royalists had 'killed' most of the Parliamentarians, and drove a troop to the ammunitions shed. A barrow of supplies had just been carted out, and the shed burst into flame to destroy what little was left. So the Royalist had both won and lost the day. A round of applause rose the 'dead' on the field, and the troops were applauded as they reformed to salute the generals. Most of the onlookers departed, but I stuck around to watch this last march. Wearied but pleased, they kept in marching formation. There was one injury: someone was toted into an abulance with a neck brace on. Yesterday's battle had one casualty: a broken rib. In the meantime, the troops marched down to their mass camp, I would assume to revel in the weekend's activity. I had the feeling that they were disappointed in us, the punters. It didn't seem like there was much intereaction with the 'crowd line' or cheering the various sides. On the other hand, maybe the Sealed Knot didn't really care what the crowd thought: they were battling for the fun of it. Little that I know about this era, I have learned that the Sealed Knot are remarkably accurate about these 'musters', down to the type, arrangment and colour of clothing they wore. The 'Living History' camp next to the field was sparsely attended, in fact, they were starting to pack up. There weren't that many people around in this horrid weather day. I wandered over to the rest of the fair, which was the usual arrangement of coin-tossing and car-sales and burger tents. Most of the place was shutting down: the steam engines were cooling off, the carriages were being put onto trailers, and the wild west show was a ghost town of half-struck down facades. I popped into a flower display tent to be surprised by the lurid rainbows of a hundred different types of dahlias. That was the only other bit of entertainment for me. I looked back down at the tents of the Sealed Knot, having a feeling that there, as bruises were soothed and sweat was wiped off, was where all the fun was. I'm going to have to sign up.